This is a subject not a lot of people talk about, because not many people understand it. Which is a shame, because it can be one of the most powerful techniques in all of marketing. And it’s something everyone actually knows how to do – we do it our whole lives, ever since we were children. It’s storytelling. This article will explain how to use storytelling in marketing. Including a cheeky and fun example that I have used recently! Let’s get to it. We all really know what storytelling is, because humans have done it all their lives since time immemorial. People tell stories all the time. They tell true stories, fake stories, long stories, short stories. But what are stories? A story is just a sequence of events that happens to a character or group of characters. The might be real people or made up people. The point is that they are not random people, they are characters that are explained and developed. And there is usually some drama or conflict that occurs. Someone going to the shop and buying some milk is not a story, that’s just a journal of what someone did that day. Someone going to the shop but getting mugged and chasing the robbers down the street and getting knocked over by a car in the process is a story. There is drama and conflict and a struggle. Good guys and bad guys. Important events happen in a sequence. This is what makes a story. Storytelling works in marketing (and everything else) because humans are physically hardwired to pay attention to stories. Have you ever found yourself staying up late watching some crappy movie, just because you wanted to find out what happened in the end? Or have you ever been hooked on a soap opera, even though the acting was bad and the dialogue cheesy, because you were invested in the characters and needed to know how things turned out? This is the power of storytelling. It works because stories are how humans make sense of the world. 99% of events in the world are just random stuff. We think the world is made up of stories because we pay attention to stories and we remember stories. We don’t notice or don’t remember the time someone went to the shop and bought milk. We notice and remember the time someone got mugged and hit by a car. We pay attention to big events with drama and conflict, even though they hardly ever happen (compared to the random everyday stuff that happens all the time). There are many different types of stories – and many components or sub-components of stories. You will recognise most or all of these from stories you have watched, read or experienced yourself. These stories can be found in history, in real life, in books, movies, and TV shows. Once you get better at recognising them, you will start seeing them everywhere. And lastly, there is a special “master story” type that is enormously powerful and pervasive. But let’s go through the basic story types and components first. Love stories are as old as time and I’m sure you’ve seen more than you can count. Romeo and Juliet is the most famous example, but every day thousands of these get churned out as trashy romance novels or cheesy soap opera episodes. Transformation is a very common and powerful story, and can be either a story in itself, or a component in a bigger story. It usually takes the form of someone learning a skill (the Karate Kid, Star Wars) or coming out of their shell and achieving things against great odds (Flashdance). Betrayal is usually a component in a story rather than a story in itself, but it can be very powerful, especially for creating villians and antagonists. Jesus Christ and Julius Ceaser are famous historical examples. Gladiator and The Last Jedi were recent films that featured this storyline. Betrayal stories are often involved with Revenge or Quests, and can often be found in the Hero’s Journey. Revenge is a very tricky story to work with. Revenge can often be a “dark” or “guilty” emotion, that people feel but aren’t comfortable with or proud of. Revenge is often something that goes wrong or fails in stories, for this reason. It can be difficult for an audience to relate to a hero motivated purely by revenge, though sometimes it can happen (such as in the recent TV series called simply Revenge). Sometimes a Revenge story component happens as part of a Quest, Disaster or Rescue story. Redemption is an unusual but compelling storyline that is difficult to pull off but can have a massive impact. Clint Eastwood’s Unforgiven pulled this off and won a bag of Oscars. But there was a Redemption storyline in Three Billboards outside Ebbing MIssouri that turned a lot of people off and created controversy. Disasters are a common theme in movies, especially because they often are a trigger for a Rescue, Quest or Hero’s Journey storyline. They are not usually storylines in and of themselves, although there was a strange trend in the 1970s of movies that were entirely about disasters (Earthquake, Towering Inferno, etc). Rescues are another common storyline in books and movies. The wildly successful Taken series of movies showcases this theme, though there are countless others. It is usually a person that needs rescuing, but not always. There was a strange trend in the 1980s of movies about places that needed rescuing (“We have just five days to come up with half a million dollars or those developers are going to turn this karate school / dance studio / youth centre / gym into a block of apartments!”). Weird huh. This is usually a story component rather than a main storyline, but it is a very common trope, especially in police or action movies – the classic “cop buddy” movies where two unalike people have to work together to solve a crime (Lethal Weapon and all its imitators). Unlikely Friends can often also become a Love Story. This is also a component rather than a main story, though it can be very memorable – Darth Vader fighting Obi-Wan Kenobi comes to mind (and remember, this happened twice). The quest is one of the most widespread and loved stories of all time, and is really a basic form of the legendary Hero’s Journey story (coming up soon). Half of the books and movies out at the moment probably feature some variation of a quest: a difficult mission given to an unlikely hero who must overcome odds to defeat some evil or win some prize. A Quest story will often incorporate betrayal, revenge, a love story, and sometimes rescue or redemption. The most powerful story type of all time is a very specific type of Quest storyline called the Hero’s Journey, or Monomyth. A writer named Joseph Campbell noted familiar patterns in stories throughout the ages (over thousands of years) and defined a structure for this story in his book “The Hero with a Thousand Faces”. 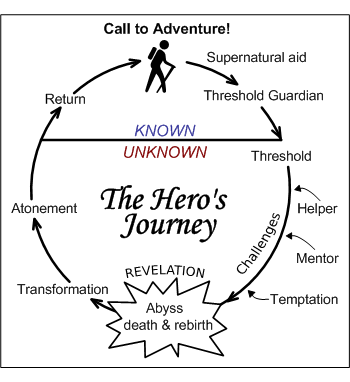 The Hero’s Journey is basically a story of a hero received a call, challenge or invitation (by a character type called a Herald) to leave his familiar world, and venture into an unknown world to defeat some kind of villain or impending doom. The hero is usually an unlikely hero (think Luke Skywalker, Peter Parker, Harry Potter) and often refuses the call at first. But they realise that their familiar world will be ruined if they do not step up to the challenge. They enlist the aid of an Ally or two to help them in their quest and receive instruction or guidance from a Mentor of some kind (such as Obi-Wan in Star Wars). The may also be some comic relief offered from a Trickster or two (Merry and Pippin from Lord of the Rings, C3PO in Star Wars). They have to deal with the shifting personality of a Shapeshifter (Han Solo in Star Wars, Gollum in Lord of the Rings), whose loyalties are uncertain (sometimes this can turn into a Betrayal subplot). After passing through one or more Thresholds (challenges) and defeating or bypassing one or more Threshold Guardians (opponents or difficulties), they must overcome a Shadow (villain, antagonist or disaster). They emerge transformed (see the Transformation story type above) and return to the known world, having saved it. This might seem odd, but once you get your head around this, you will see this story type over and over and over again. The characters and settings may change, but nearly all of the great stories of all time follow this pattern. Storytelling can be used anywhere. The two places they are most effectively used though are in sales pages and emails. Sales pages often start with a story – they establish a sympathetic character (“I was flat broke and didn’t know what I was doing!”), and describe some sort of difficulty (“I needed money in 20 days or I was in trouble!”) and overcoming of a challenge (“Then I found something amazing – you won’t believe what happened!”). Hmm, an unlikely hero overcoming challenges with the help of a mentor – is this sounding familiar? As you can see, stories are everywhere. I am not a product owner nor a professional copywriter, so I don’t write sales pages. I’m an affiliate marketer, so I do promotions. And I find emails to be a great place to write stories. Facebook posts can work too. The great thing about emails and Facebook posts is you can just have fun with them. They’ll be flushed down the digital toilet in a couple of days one way or another, so it doesn’t matter if they fall flat or come out wrong. Just play around with them and have fun and see what happens. Just look for familiar patterns in your life, the life or someone you know, or a famous or familiar story, and see if you can relate it to your promotion. It might be something you can relate to the product, the vendor, the sales page, the product’s benefits, anything. The link can be a bit silly and tenuous too. My first $100 day was from a Facebook promotion I did for a CPA course called CPA Pirate. Now, CPA Pirate (it’s a great course by the way) teaches you how to do CPA affiliate marketing – it has nothing to do with pirates whatsoever. Pirate is just a fun name and a theme they chose for the product and the sales page (it features pictures of big pirate ships). So I did a Facebook post (get Instant Buyer Traffic or Emoji Traffic if you want to learn how to do these properly) with lots of pirate talk, pirate jokes, and references to Pirates of the Carribean. And I got a lot of responses and a bunch of sales! Pirates are a classic story and Pirates of the Carribean is a famous movie that everyone knows or can relate to. 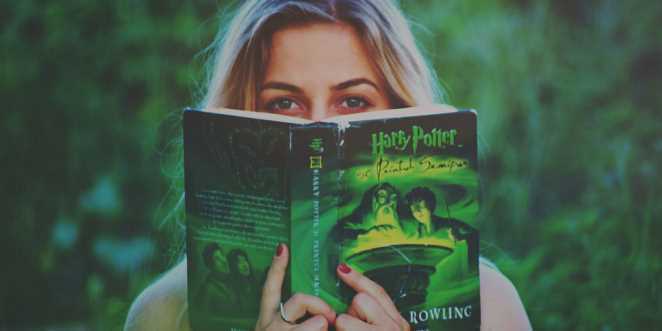 So throw in these stories or references wherever you can – people’s minds are magically attracted to these (much more so than the usual boring sales pitch stuff that we see everywhere). An interesting anecdote about the power of stories: when the movie Top Gun came out in the 1980s, the US Navy started noticing an increase in Navy applications. So they sent out recruiters to movie cinemas and pulled in an enormous amount of new recruits. That movie wasn’t even trying to sell people on joining the US Navy! It was just a story (Quest with Love Story) so powerful that it sold people the idea of joining the Navy just by association. Here is an example I did of storytelling in a promotional email. I have a very small list so it’s hard to say how it really went, but it had a good open and clickthrough rate. I was promoting the new Brendan Mace and Jono Armstrong product The Fuego Breakout, and I realised how interesting it was pretty much 100% Jono – Brendan helped with the marketing and lent his name to it, but all the content was Jono. And he was Brendan’s student just a year ago, and here he is building and putting out a huge powerful product that sold like gangbusters. It made me think of the classic Student Challenges Master storylines in movies. So this is what I wrote (it’s just for example purposes – don’t steal it or I will hunt you down and kick you in the throat, Karate Kid style). My favourite scenes in movies are when a student challenges the master. Like when Darth Vader fights Obi Wan Kenobi in Star Wars..
Or when Neo has a kung-fu punchup with Morpheus in The Matrix..
Or when the Karate kid lays the smackdown on old Mr Miyagi in the Karate Kid..
What, did I make that last one up? I think I must have… would have been cool to watch though! Anyway, one of the great masters of internet marketing, Brendan Mace (all time #1 product vendor on Warrior Plus, all-time biggest selling product on Warrior Plus, yadda yadda yadda) took on a new student about a year ago, Jono Armstrong. Except now, Jono is KILLING it. He’s developed a new technique that is shockingly powerful… and I think in a few months, he will probably be leaving Brendan Mace in his dust! It’s called the Fuego Breakout. It rocks. The Fuego Breakout product itself has nothing to do with students or karate or anything, but it doesn’t have to. Just look for stories in or near or around products. They are everywhere. Read the claims on the sales page. Read the testimonials. Read the reviews that other marketers have written about products. There is fodder for stories everywhere. And you don’t have to write the stories – you just have to tell the stories. You just have to relate things to stories. You just have to tie existing products and ideas and concepts into existing stories. It’s easy and fun! Everything Ihave been talking about so far is about short-form stories. A movie, or a book. But there are also long-form stories – a 12 episode TV series (which may have multiple seasons), a series of novels, or a trilogy of movies. These are long-form stories, and these often have story arcs. Story arcs are where a story spans multiple books or movies or TV series seasons. You have stories within them that can become partially resolved but have unresolved threads that carry on and on. These are harder to get right but can be hugely, enormously powerful. Just watch how people get hooked on shows like Lost or Game of Thrones. They get obsessed with finding out what ends up happening to the characters. A legendary email marketer called Andre Chaperon came up with an email technique called Soap Opera Sequences, which utilises this idea of long-form stories and story arcs. He in fact learned by from paying enormous amounts of money to consult with top Hollywood script-writers. Andre teaches this technique in a course which he doesn’t even publicly advertise or sell called Auto-responder Madness, which I think costs about $500, and from what I gather is the most advanced email marketing training on the planet. If his income claims are true, he typically achieves an earning per subscriber of between $40 and $100 for an email campaign – orders of magnitude beyond most mortals. I haven’t taken the course (I don’t even know if it’s for sale), so I can’t talk about Soap Opera Sequences much. If you want to learn more, I think you can sign up for some kind of email list of his here – or Russel Brunson talks about it in his Expert Secrets and Dotcom Secrets books. The rough idea is that you send emails with stories in them that span multiple emails. So your offer might be at the end of a series of five or ten (or twenty or thirty) emails. With cliff-hangers, sub-plots, dramas, all the juicy story components I’ve described above. Anyway, this article ended up becoming a lot longer than I originally planned, but this is a super interesting topic and I hope you’ve enjoyed it. As always, if you have any questions about this stuff, drop a note in the comments below, I will read and personally respond to every single one! Previous Post The number one reason bloggers fail Next Post Which blogging platform should you use?